Select how many decimal places you would like the result rounded to. Note that you can change the number of places before or after solving the triangle. Select whether you will be entering angle values as degrees or radians. Select the radio button that indicates which three of the triangle values are known. Upon making your selection the triangle calculator will load the appropriate entry form. Enter the length of side a. Enter the length of side b. Enter the length of side c.
Enter the angle of vertex B. Enter the angle of vertex A. This is the type of triangle based on the entered and computed triangle values. This is the length of side a of the solved triangle. This is the length of side b of the solved triangle. This is the length of side c of the solved triangle. This is the angle of vertex A of the solved triangle. This is the angle of vertex B of the solved triangle. This is the angle of vertex C of the solved triangle. This is the perimeter (P) of the solved triangle. The formula used is P = a + b + c.
This is the semi-perimeter (s) of the solved triangle. The formula used is s = (a + b + c) / 2. This is the area (K) of the solved triangle. The formula used is K = (base x height) / 2. This is the radius (r) of the inscribed circle of the solved triangle. The inscribed circle is the largest circle that will fit within the triangle. The formula used to find the radius is, r = sqrt[ ((s-a)(s-b)(s-c)) / s], where s is the semi-perimeter of the triangle. This is the radius (R) of the circumscribed circle of the solved triangle. The circumscribed circle is a circle that passes through all three vertices of a triangle. The formula used to find the radius is, R = (abc) / (4K), where K is the area of the triangle. This is the length of the median (ma), which is the line that runs from vertex A to the mid-point of side a (the opposite side). The formula used for finding the length of the line is, ma = (1/2)sqrt[2c2 + 2b2 - a2]. This is the length of the median (mb), which is the line that runs from vertex B to the mid-point of side b (the opposite side). The formula used for finding the length of the line is, mb = (1/2)sqrt[2c2 + 2a2 - b2]. This is the length of the median (mc), which is the line that runs from vertex C to the mid-point of side c (the opposite side). The formula used for finding the length of the line is, mc = (1/2)sqrt[2a2 + 2b2 - c2]. This is the height (h) of the triangle using side a as the base. The formula used to find the height is, ha = 2 * (K / a), where K is the area of the triangle. This is the height (h) of the triangle using side b as the base. The formula used to find the height is, hb = 2 * (K / b), where K is the area of the triangle. 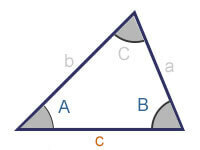 This is the height (h) of the triangle using side c as the base. The formula used to find the height is, hc = 2 * (K / c), where K is the area of the triangle. This is the coordinate used for vertex A. In order to plot the triangle for drawing, vertex A is always located at coordinate [0,0]. This is the coordinate used for vertex B. In order to plot the triangle for drawing, the y coordinate of vertex B is always 0. The x coordinate of vertex B is always equal to the length of side c.
Sorry, your browser does not support canvas. Please upgrade to the latest version of your web browser software. This triangle solver will take three known triangle measurements and solve for the other three. The calculator will also solve for the area of the triangle, the perimeter, the semi-perimeter, the radius of the circumcircle and the inscribed circle, the medians, and the heights. Plus, unlike other online triangle calculators, this calculator will show its work by detailing each of the steps it took to solve the formulas for finding the missing values. Finally, the triangle calculator will also calculate the coordinates of the vertices, the centroid, and the circumcenter, and draw the solved triangle based on those coordinates (requires latest version of your web browser software). Please double-check my calculations before considering them to be valid, as I can't test for all possible entries. If you do discover an issue with the calculations, please use the feedback form below the calculator to let me know the settings and entries that generated the issue so I can trouble-shoot the problem. Thank you! Select your rounding preference and indicate whether you will be entering angles in "degrees" or "radians". 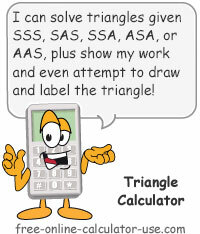 Select either SSS, SAS, SSA, ASA, or AAS to indicate the triangle's known values. Enter the three known values. Tap the "Solve" button. This will solve for the missing sides and/or angles, show the steps taken to solve the triangle, and, if you have an HTML5 compatible web browser, draw the triangle.